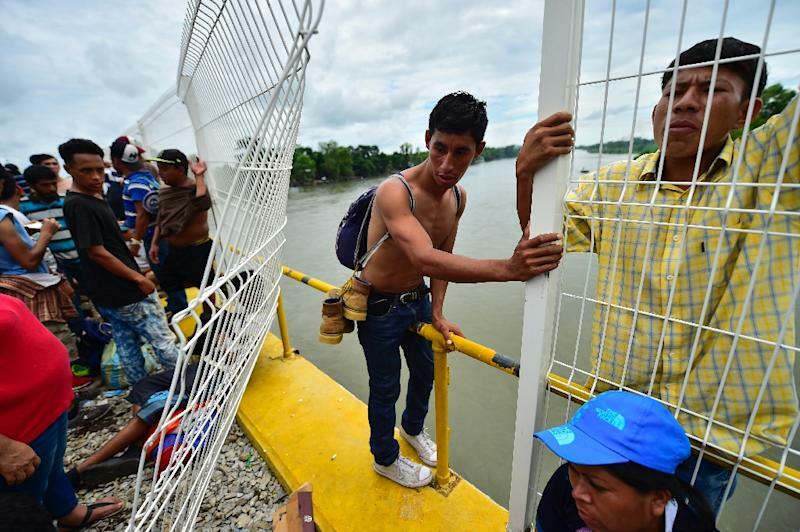 Ciudad Hidalgo (Mexico) (AFP) - Mexican authorities allowed dozens of women and children from a US-bound Honduran migrant caravan to enter the country Saturday but thousands remain stranded on a border bridge between Guatemala and Mexico where riot police barred their progress. 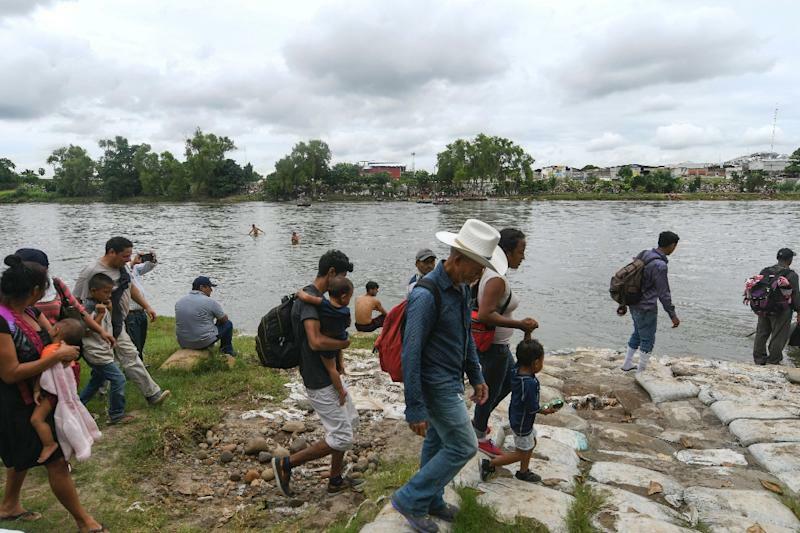 Mexican authorities said around 900 other migrants -- tired of waiting on the bridge -- resorted to crossing the Suchiate River below on makeshift rafts and police did not intervene as they clambered up the muddy riverbank on the Mexican side. Many of them had spent more than 24 hours on the packed bridge where heat and hunger was adding to a growing sense of despair. Efforts to retrieve them were ongoing, authorities said. US President Donald Trump, speaking at a rally in Elko, Nevada, kept up his rhetoric against the migrants and suggested the caravan was politically motivated. "The Democrats want caravans, they like the caravans. A lot of people say 'I wonder who started that caravan?'" he said. He thanked Mexico for blocking the caravan's progress. "Mexico has been so incredible. Thank you Mexico and the leaders of Mexico, thank you. And you know why, because now Mexico respects the leadership of the United States." Last week, Trump threatened to cut aid to the region, deploy the military and close the US-Mexican border if authorities did not stop them. Honduran President Juan Orlando Hernandez and his Guatemalan counterpart Jimmy Morales continued Trump's theme after they met in Guatemala to discuss the crisis Saturday. "This migration has political motivations," said Morales, "which is violating the borders and the good faith of the states and of course putting at risk the most important thing, people." Hernandez also deplored "the abuse of people's needs" for "political reasons." "Without a doubt, we have a lot to do so that our people can have opportunities in their communities," he said. The caravan originated in the Honduran town of San Pedro Sula a week ago, with about 2,000 would-be migrants drawn together by social media. It is notably different from the "Migrant Viacrucis" organized in April every year by NGOs to draw attention to the plight of Central American migrants. 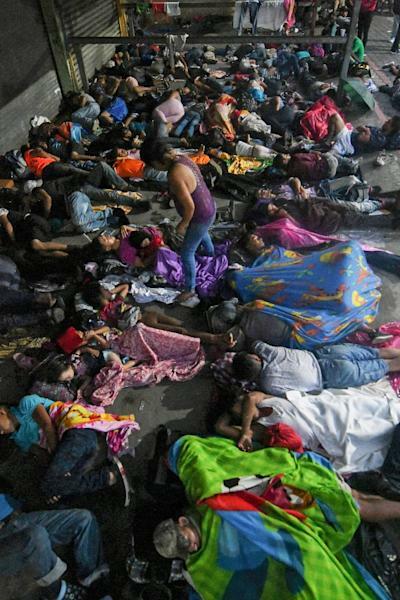 The women and children had spent the night on the bridge where hundreds slept in the open, as well as in the main square of the Guatemalan border town of Tecun Uman. Guatemala has organized a fleet of buses to take Hondurans back to their country. Sections of the crowd hurled rocks and other objects at hundreds of riot police, who responded with rubber bullets and tear gas -- stalling the caravan determined to reach the United States. Some, like 25-year-old Honduran Bryon Rivera, had decided to give up on a long-held dream of a better life in America. The soft-spoken 25-year-old said he was traveling with three friends who decided to remain in the caravan, but that for him, the fear of being deported once he reached Mexico was too much.